Discover New York City with your friends and family in this well appointed four-story town home situated on the historic, tree-lined “Doctor’s Row”, a mere block from Central Park on Manhattan’s Upper West Side. Constructed in 1900, this comfortable gilded aged townhouse has been updated with a gourmet stainless steel kitchen, including a 6 burner Viking stove and a large stone island. Entertain in the lushly furnished open living room or roam the park, a stone’s throw from your front step. Retire to one of four well appointed bedrooms on the two upper floors each sharing a Tuscan tiled full bath with the master bath having jacuzzi tub and the third floor bath, a claw foot tub. The two front bedrooms get treated to ample morning sun. Additionally there is a washer dryer on the third floor. A spiral staircase in the corner of the parlor floor brings you to the garden level housing an entertainment area with a large flat screen TV, a pull out sectional sofa and a card table. The garden level also has a full bathroom. There are high ceilings, hardwood floors, original brass chandeliers, and decorative fireplaces throughout the historic residence. This short term rental offers an amazing location, impeccable modern appointments and old world charm. We loved David’s place, it was in a great location, only a couple of blocks from the nearest Subway which is all you need to get around! Warm to come home too after our cold days out. Plenty of room for the 6 of us, we pretty much had our own floors! Would be great for even bigger groups than that. Thank you David we hope to be back in the future! Very spacious and well specified house, close to Central Park and easy walking distance of several subway lines. Also close to grocery stores and other shops. Some fittings and furnishings slightly tired, and although bed linen spotlessly clean some of the floors and rugs could have been cleaner. Don’t let me put you off though, it’s a lovely place and was perfect for our two families of four each. David was very helpful with the one small issue we had. Kitchen particularly well appointed with quality fittings. The perfect location to access all of NYC, spacious, clean and great for groups! We traveled as a group of eight people and loved David's house. It provided great shared space to hang out and the rooms are large and spacious. The beds were very comfortable and linens nice and warm. 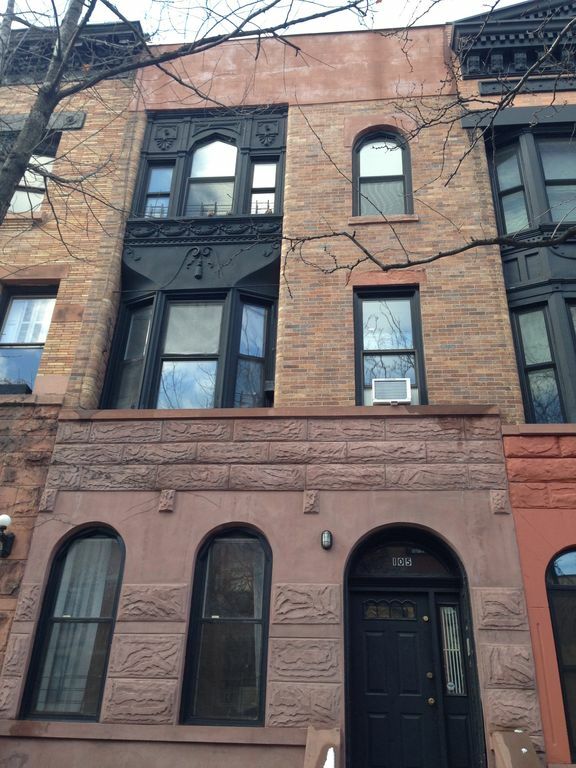 The location is steps away from the subway and central park. There is great shopping, restaurants and grocery stores are a stones throw away. When we return we will be coming back to this exact house. David is extremely friendly and helpful with suggestions for local eateries, and sights. We highly recommend! We came with 4 moms and 4 daughters in November. The house was beautiful and the location was perfect. Each of us had our own private bedroom. Kids enjoyed playing and watching tv downstairs in the den. House is in a quiet neighborhood and just 2 min walk from Central Park . Davis was very accommodating and professional. He recommended great local restaurants and was even willing to make reservations for us. Will come back and stay again. Four couples stayed here comfortably for NYC Marathon weekend. This is an older home, which we found to be part of the charm. Loved the proximity to Central Park - just a block away. Walking distance to a small grocery store - its actually on the same block, so it was easy to get what we needed for the weekend. Subway station is a block away. Ubers were Johnny-on-the-spot ... always there within a minute or two of calling them up. Kitchen is outfitted with high end appliances. We liked that there was not a tv in the main sitting area, because it forced us to visit with each other and talk to each other and not be distracted with news and noise. There was more than enough room for a large group. Be prepared for stairs. We had a couple of older people in the group. Put the younger ones on the top floor, and the older folks managed. Only a few small issues (not deal breakers), some horribly loud construction was going on outside all night long on Thursday night. Thankfully they knocked off for the weekend nights. The trash / recycling situation was a little confusing, but we did our best to comply. There is not a bathroom on the main floor. Thats the one thing I would find a way to change if possible. Finally, David, the owner was extremely accessible by phone or text to any questions or needs we had. Always very helpful. All in all, a beautiful old home in a nice neighborhood. Would stay again.